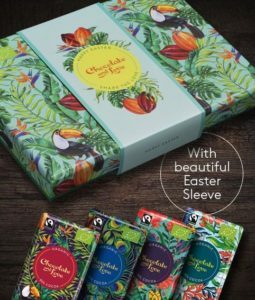 With Easter just around the corner and Spring in the air it’s time for all you chocoholics to get buying your favourite Easter treats, by choosing Fairtrade chocolate this Easter you can help support farmers and workers around the world by sharing that hope and love a little bit further. Here are our top picks to buy this Easter. There is something here to satisfy each of the chocoholics in your life. 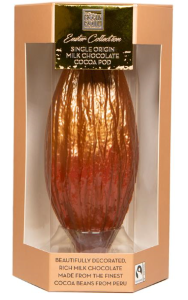 From luxury dark chocolate bars and eggs to silky milk chocolate and cute bunnies to something very different a Peruvian cocoa pod decorated with a shimmering ombré lustre. Divine’s Flights of Flavours includes five individually wrapped smooth dark chocolate eggs. With flavours including smooth hazelnut, raspberry and pink Himalayan salt, they offer a taste sensation. Each egg is made from Fairtrade cocoa, grown and picked in Ghana, as well as being vegan and using zero palm oil in the whole process from bean to bar. 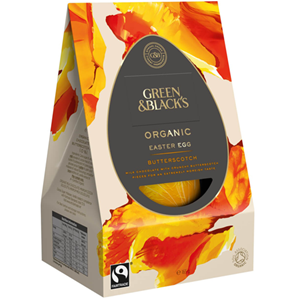 Fairtrade and luxury chocolates, Green & Blacks have turned their best-selling milk chocolate and butterscotch bar into an Easter egg that we can’t resist adding to our favourites. 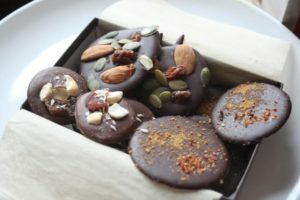 Coins of Milk & Dark chocolate sprinkled with a variety of dried fruit, nuts, seeds & spices. Fruit & Nut Mendiants are a perfect Easter gift, for larger events you can purchase unwrapped in bulk and present in your own bowls or wrapping. Made from Fairtrade Peruvian cocoa beans, this chocolate has been moulded into the shape of a Peruvian cocoa pod and decorated with a shimmering ombré lustre. It’s available in milk and dark chocolate. Luxurious gift box showcasing a selection of chocolate bars with great care and attention to detail and quality in these award winning chocolate bars. Elegant gift boxes are a perfect treat for the serious chocolate lover. 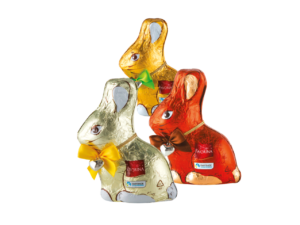 Mini chocolate bunnies are a favourite with the little ones and great for the treasure hunt. Maltesers Medium Easter Egg. 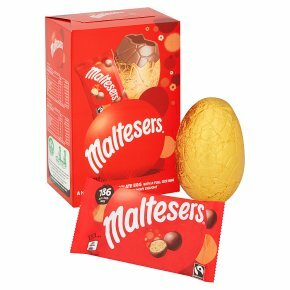 A hollow milk chocolate egg with a full size bag of Maltesers, full of crunchy delight! 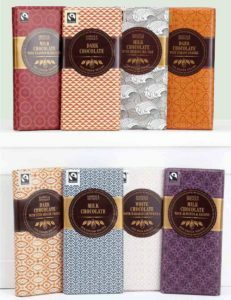 With a selection of 8 delicious chocolate bars from dark chocolate infused with clementine to milk chocolate infused with butterscotch & maple to white chocolate infused with vanilla from Madagascar, you can create your own Easter hamper a beautiful gift for any chocolate lover!